Amsterdam, c.1606. 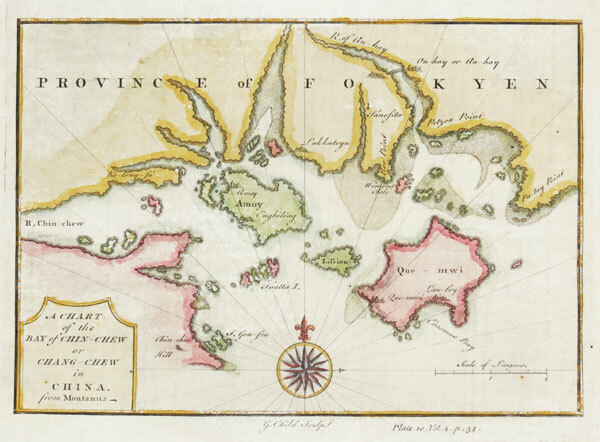 Despite the title this map shows most of the Far East, including India, China, Korea, Japan and the Philippines, with north west America top right. This is an example of the first plate, engraved by Pieter van den Keere rather than Jodocus Hondius. Amsterdam, 1613. 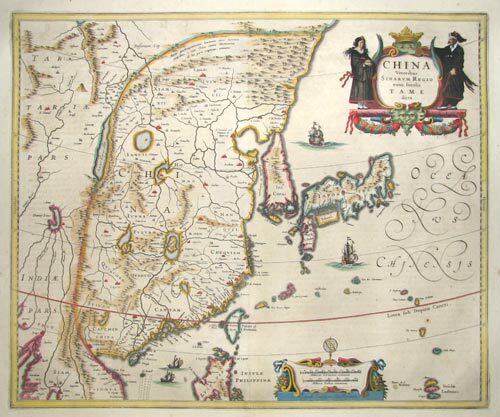 An early example of this map of the Far East, first issued 1606, showing from India to China & the Philippines. With two fine strapwork cartouches in full original colour. Amsterdam, Jan Jansson 1647. Decorative map of South East Asia, showing India and Japan in the north, and New Guinea and partial sections of the coast of Australia in the south, with cartouches for the title, dedication and scale. Paris, 1683. 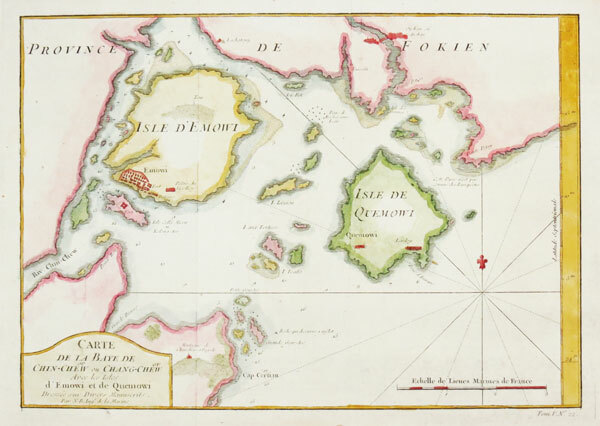 Japan map, with a decorative title cartouche, published in Mallet's 'Description de l'Univers'. Paris, 1683. An illustration of traditional Japanese costume, published in Mallet's 'Description de l'Univers'. Paris, 1683. An illustration the city of Miyako, published in Mallet's 'Description de l'Univers'. Paris, 1705. 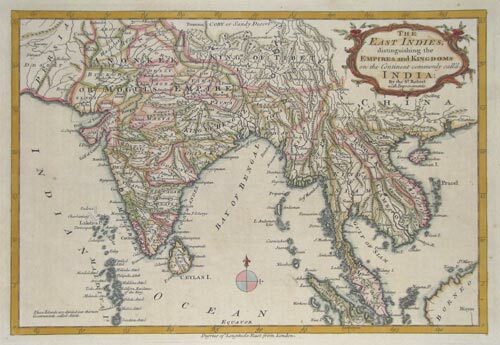 Map of India and Indochina. London, c.1760. 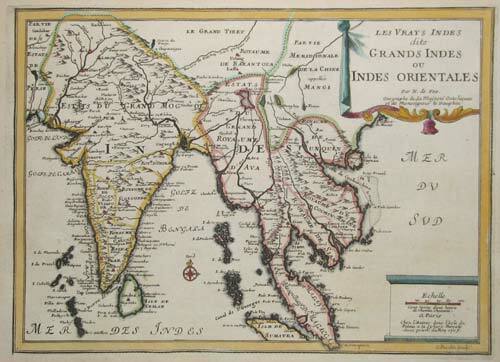 Map of India and Indo-China with a decorative rococo title cartouche. Venice, c.1785. 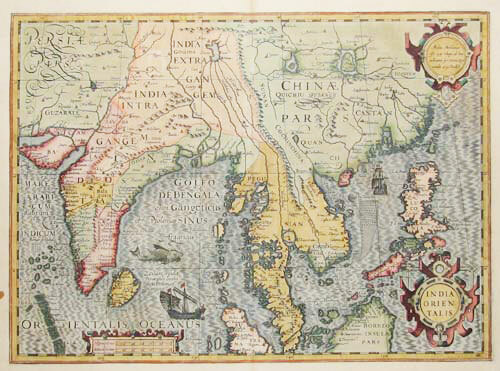 One sheet only of a four-sheet map of the East Indies, showing Formosa and the northern Philippines. With the title cartouche. London, c.1830. A colourful map of Central Asia from the Caspian Sea to Manchuria, including Mongolia, Tibet and Bokara. London, John Tallis & Co, c.1851. 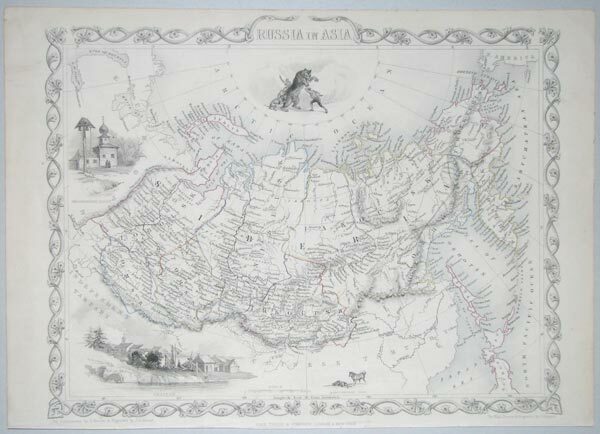 Northern Asia, with Siberia and Kamchatka. With four vignettes. Amsterdam, 1761. From a Dutch edition of Bellin's atlas. Amsterdam, 1647. 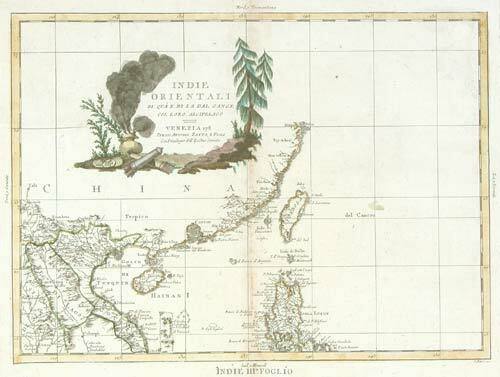 China, Japan and the northern Philippines, with Korea shown as an island. London: Thomas Salmon, 1747. A map of the environs of Xiamen & Zhangzhou, published in the 'Universal Traveller'. Nieuhof describes the place: 'The place is small, but well-built, has a wealthy suburb, and drives a great trade. The revenue arising from the custom paid by vessels is very considerable'. Paris, c.1750. A map of the environs of Xiamen & Zhangzhou. 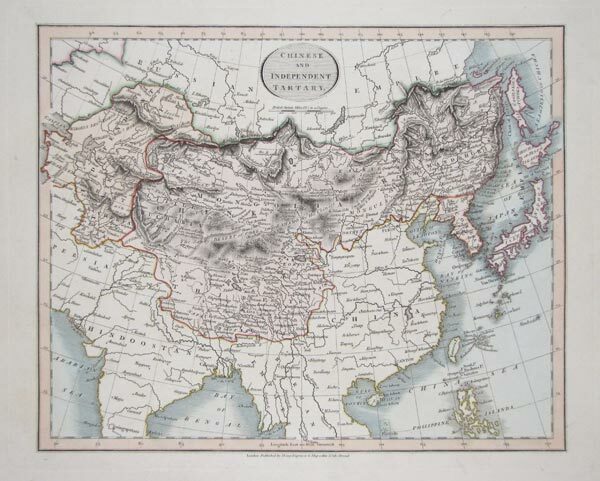 Map of Chinese Tartary, with the Silk Road, Great Wall of China & Tibet. 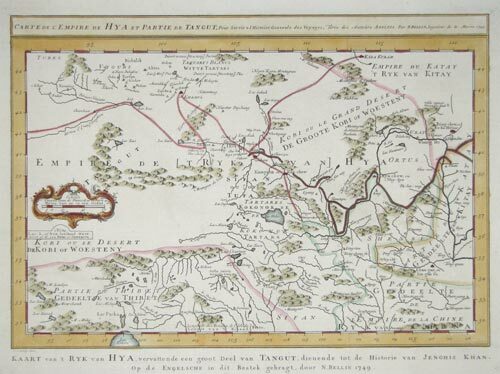 The Hague, c.1760. 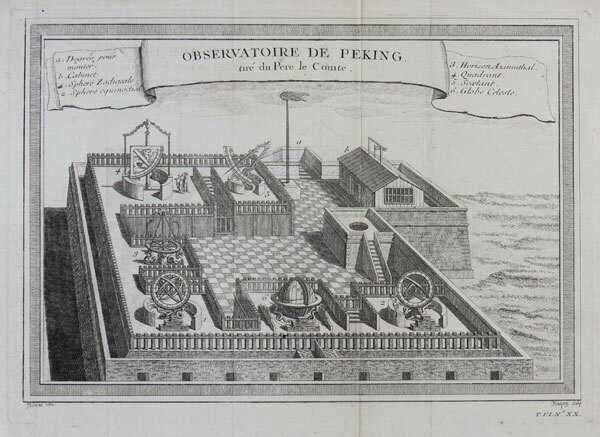 Engraved by Schley for a Dutch edition of Prevost, illustrating the story of Gengis Khan. Paris, c.1760. 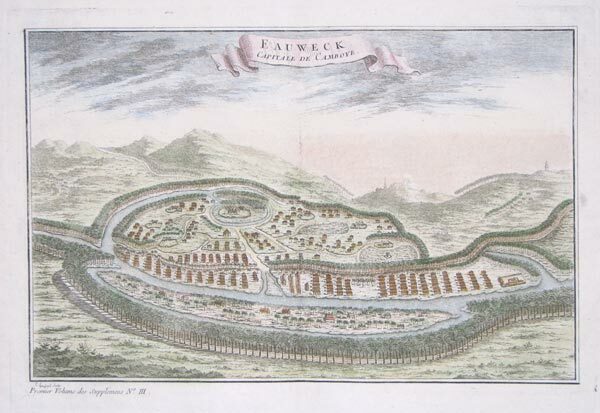 A view of Jo Si Wo after Nieuhof, here engraved by Schley for a Dutch edition of the Bellin/Prévost 'Histoire des Voyages'. Nieuhof describes the place: 'The place is small, but well-built, has a wealthy suburb, and drives a great trade. The revenue arising from the custom paid by vessels is very considerable'.